This week, we’re featuring @mtnwomanmedicine. She’s a medicine goddess from the mountains, in deep with herbs and nurturing an amazing sustainable landscape called Nemeton. We hope you enjoy her thoughtful, detailed and informative replies! Constantly amazed at what incredible stories arise from this series, and this one is totally special! 1. @mtnwomanmedicine, you live in the most extraordinary place, and it’s from this mountain you get your name. Our readers would love to know more about it, I’m sure – could you describe it a little, and perhaps tell us how you got there? Hi, I’m Raine Ford. I’d say knowing what I know now, I’ve been a mountain woman all along. Since I was a girl, homeschooled, living on a 2 acre homestead, running through the woods and trails on horseback. The Mountains have always been a home to my heart. Even when life took me in a different direction and I entered the wild world of modern healthcare and big cities, the thing that would sooth my soul the most was being on a WalkAbout in the Woods. I was continually drawn irrevocable back to the solitude, the harmony, and tranquility. After a few injuries working as a paramedic, I left that world and began revisiting my roots. When I met this particular mountain 8 years ago, I fell in love. It has since been called Nemeton, which is gaelic, meaning: Sanctuary, Place of Beginnings, Center Point and Grove. The Medicine of The Mountain, for me, has become the practice of the Mindful Daily Routines, the Setting & Holding of Space, Tending The Mountain Temple, living a life of deep Personal SelfCare, Living In My Heart, with authenticity and deep compassion. When I first came here it was raw and wild land, without a driveway, let alone a well, septic or any structures. I alternated between camping on the land and couch surfing with friends until I had a more amicable arrangement (well, septic & storage structure). Much of my first year was spent carving the land with hand tools, planting transplants I had gathered from other places, building sacred spaces, and tending the two main waterways running through this 5 acre side of a mountain. These days Nemeton has chickens, ducks (with a sturdy coop and chicken run), a Moosedog and a Felix The Cat. A 12×20 greenhouse was gifted this winter that will allow us (my partner and I) to extend our seasons as well as grow exotic, non local plants. We are currently working on building yet a third addition to the main food garden, inoculating logs with Reishi and Shitake mushrooms, building rustic shelters, expanding the perennial herb gardens as well as tending and growing a young and old orchard. We are also looking to experiment with Gas Digesters as well as building a Gasifier for converting waste to free energy. Our goal this year is to turn Nemeton into a Non Profit (501C3). And while I could do it alone, have for several years in fact, I’ve been blessed to share and play with a few very special companions. Together we create and maintain the foundation that is Nemeton, which has, over the years, become A HumanEarth Sanctuary & Learning Community. To many it’s a simple 5 acre plot of land set almost a quarter of a mile off a secondary road located between an old historical district and a sleepy little town. To me and those that travel here it is a magical land filled with perpetual surprises. From its sacred spaces, crafted with humans and nature in kind living in balance with each other. To its simple comforts, ease and sustainability. It’s Permaculture based plan and Mountain Etiquette helps to keep all within alignment to the natural rhythms. Nemeton is beautiful. It’s peaceful. It’s magical. 2. This landscape seems to inform much of what you do in your real life. How has living with nature become part of who you are and what you do? When I first began my Journey to living a Sustainable Life back in my late 20’s it was, at first, with a tribe of folks (5-8 of us). 6 years later, they had all dispersed about their own ways, and I found myself alone with my vision. In my lost and grieving state I found myself yearning for a connection that was not purely human based (humans confused and confounded me then). I was brought to my knees that winter by the sight of the trees, naked in their season – seemingly barren. It echoed how I felt. It was winter until I was able to dig a little deeper and began to see into the Laws of Nature. Nothing ever truly dies. Even those barren trees were merely in their state of deep rest. Its “death” a transformation, serving in yet another way, along a different path. Understanding that, helped me to grasp the depth of value in the “Shifting State” of things. Simply by watching nature in its day-to-day process, showed me the HOW’s of how to live, simple, beautifully, in harmony with myself and the world around me. Those trees didn’t question why they were naked nor did they wish it to be summer, Right Now! They simply stood there and slept, deep in their roots till the soil warmed and length of light returned. They Surrender to their Isness in a Beautiful way. Nothing in Nature Questions it’s Place; like how humans do. It’s in that quiet way of Walking with these Beings that I learned how to see myself and others with the same deep compassion and truthfulness, while not being torn asunder at every quivering passing wind. When I finally landed, fully, on this Mountain, I was still deeply questioning. Had I had done the right thing? Thinking to myself “what were you even thinking doing this ‘alone’?” How was I going to make it, and other such litany of questions. (To the point that I was close to being driven mad by it) A mentor at the time, casually mentioned in an offhand kind of way, “ya know… Nothing in Nature Questions its Place, so why are you? What are you getting out of all that questioning and doubt”. Not being able to find an answer I went and sat with that thought for a good long while. I watched the plants pushing up through the snow that spring and then later the birds wrestling with finding food for their young. When we had gotten a late spring freeze, none of these beings “struggled” the way I had been (not in that emotionally tormented way). AND I discovered that as I connected with those Beings and got into the tasks of Doing, my inner struggle become less also. Living with and learning the Laws of Nature and how relevant they are to this world we live in has given me a different perspective on life. It has brought me face to face with my fears and also my deepest inspirations. It has brought me home to my Roots. I am, most definitely a Mountain Woman. Seeking to Understand this Life that we are Seeing. 4. Herbal medicines or natural medicines can have an absolutely practical and scientific-rational side, but there’s also a spiritual side to what you do and what you post about that we appreciate too. You call yourself an ‘inner cartographer’ – what a great term! Could you explain what this means, and what it involves? InnerCartography is Inner Map Making. It is a deep exploration of one’s own inner nature. It’s a mix of Shadow Work and Self Exploration, and understanding of the Other. All aimed and geared towards rich involvement with life, settling into your Isness and finding prosperity there, ultimately culminating in Service. From that point one can make choices and respond to life in a way that is healthy For The Individual. InnerCartography is that deep inner map making, and when we know ourselves and each other on a deeper level we can touch the core of our Beings and make great changes in the world. It’s hard work, yet sooo deeply Worth it. Attitude, Perspective & Willingness is Everything. This was a photo from InnerCartography I course offered this past winter (2019). In this photo, the shadow of the compass represents the shadow with each of us – it cannot be gotten rid of, it’s part of our light and can be quite reflective of WHO WE ARE, if it’s worked with from the right angle (because of the shadow, you can see the rings clearly that shows it’s a Nautical Compass.). The Compass is our guide (often found withIN us, our mission in life or those who we are around). The patina blue within the compass: shows how time and emotions (water) wears at us and also enhance us. The quartz represents the Light, and amplification possibility within each of us. 5. @mtnwomanmedicine, you are also a teacher. I’ve been fascinated by the first aid aspect of natural medicine and you teach this as a course. What would you say are the best natural medicines to have in a natural first aid kit? Some of MMW’s Emergency Holistic Medicine Kit. Deobstruents: for moving “stuck” -energy, fluids, pain etc. 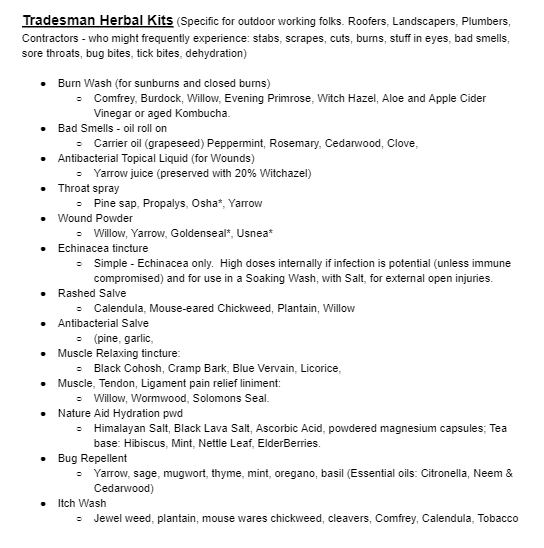 Here’s a sneak peek at one of the Herbal Kits I am currently creating. All but the * herbs are local to my area. The Herbs that are marked * are mindfully sourced and deeply valued for their strength and efficiency in their medicinal action. 5. When I asked you what plant medicines you’d select for one of our plant medicine challenges, you chose yarrow, mullein and motherwort. Why are these three herbs special to you? Yarrow: One of my GoTo plants for just about any sort of wound. I make a Yarrow Extract (juice) every year, a little ¼ oz container suits my purposes for tending large gatherings quite well. I also make a Yarrow Flower Essence which is a lovely grounding aide for those that get their energy wrapped deeply into others It helps to emotionally discern between what is “Yours” and what is “Not Yours”. For those that work on the Energetic level with plants it helps to strengthen the person’s auric field. Mullein. Is one of my favorite demulcents. I use the flower for anything that is respiratory “dry” related (including dry cough, persistent sinus infections and dry sore throat) Mullein Leaves I use mainly in smoking blends, as it helps loosen up the tar that gets stuck in the lungs of those who work around smoke, fires and who imbibe other types of smoke. I use the root in “alignment issues” typically involving the spine. Motherwort: I use for the those lacking courage or being faced with seemingly insurmountable odds. The plant offers a “lion-hearted” aspect. It calms the smooth muscle spasms of a women’s moon cycle, balances the swinging moods and grants a certain calming quality that compares to none. Great for small bouts of anxiety and feeling of dis – ease. The plants prickly nature, when it is mature, is often a signature for the kinds of people it will support – those with a intermittent prickly nature. A picture of one of Nemeton’s Gardens. Yarrow, mullein & Comfrey are common local opportunists that grow happily amongst or beside the veggies. We hoped you loved this interview as much as we did!